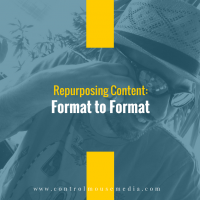 In last week’s episode, Repurposing Content Is a Part of Any Content Strategy, I talked about the three different ways to repurpose content – by format, by context, or by extent. Today, I would like to focus on the first one, which involves taking one piece of content and refactoring it to fit another format. This is the simplest way to get more out of one piece of content, making you much more efficient. There are a bunch of ways to do this, and I get into some overall strategies, and use a couple of examples to illustrate my point. Repurposing blog posts into an email newsletter – including pros and cons of publishing the complete post vs. a digest of posts. Repurposing podcast episodes or video scripts into blog posts – including a cool hack that you can use to convert audio to text. Feedly is my preferred feed reader: https://feedly.com. In repurposing content, you want to be really careful not to republish the same piece, word-for-word – duplicate content can damage your SEO ranking. Here’s an episode I devoted to doing this the right way: Content Syndication: Safe SEO Practices for Your Blog. Here’s an example of embedding podcasts in a blog post as a convenience for your readers: Using Social Media for Business: Strategies for Long-Term Success. In next week’s episode, I’ll be getting into Repurposing Content Across Different Contexts. Subscribe here (and select podcast / every new post) if you’d like to be notified as soon as new episodes are published! Published March 13, 2017 by Michael Boezi.